The Iowa Poultry Association questions how so many birds are becoming infected despite precautionary measures. It says it wants to believe that transmission is preventable. Transmission is preventable. Outbreaks are preventable. If we stopped raising birds for food, we would stop providing ideal conditions for such deadly viruses to flourish. Several years ago, I had a friend named Apollo. He would struggle to his feet as soon as he saw me and carefully shuffle to my side. His little sounds of happiness filled the air as I scratched and petted him. He ignored virtually every other human, but he lit up when I was around. I wasn’t the one who fed him nor the one who cleaned up after him. I was just his friend, and he was mine. And Apollo? He was a turkey. Most people never get to experience the companionship of turkeys. They don’t understand the complex lives that turkeys, chickens and other birds lead. I was the same way. Prior to meeting Apollo, I knew nothing about the birds we usually raise for food. I now know them to be full of curiosity, playfulness and joy. And I know they have a deep capacity for pain, terror and misery. When I heard about the recent outbreak of bird flu, my thoughts first went to Apollo. How many Apollos would die from or be killed because of this disease? The answer, so far, is more than 24 million. 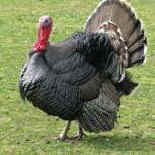 Twenty-four million turkeys and chickens who wanted nothing more than to roam free and spend time with their friends. Twenty-four million birds who knew what it means to suffer. Farmed turkeys and chickens are especially susceptible to bird flu because of the conditions in which they are routinely kept. A single shed on a poultry farm may house tens of thousands of birds. They live amid piles of their own waste, breathing ammonia-laden air that damages their immune systems. This creates the perfect breeding ground for dangerous pathogens. When one animal gets sick, the disease can quickly spread. The birds’ inherent health problems don’t help. Turkeys and chickens are bred to grow to enormous sizes—today’s chickens are four times larger than their 1950s ancestors. Today’s turkeys weigh 57 percent more than those of 1965. Contemporary breeds have increased bone, heart and immune-system problems. The stress on their bodies is enormous. Apollo had been rescued from a factory farm, and when he waddled over to greet me, it was because his tired, brittle legs could barely support the weight of his unnaturally large frame. The current outbreak of bird flu—called highly pathogenic avian influenza (HPAI) H5—has been detected in birds in 18 states. The Centers for Disease Control and Prevention cautions that it is possible for humans to become infected with HPAI H5, as viruses similar to HPAI H5 have infected people in other countries. The very nature of the influenza virus is to mutate, according to the U.S. Department of Agriculture, and new strains can occur at any time within avian hosts. And yet, we continue breeding birds to be unnaturally large and subjecting them to inhumane, squalid conditions that practically beg for an outbreak. Recently, on one farm in Iowa, 3.8 million infected egg-laying hens were killed. One farm. Almost 4 million hens. It would be better for everyone—the Apollos of this world as well as the humans who could suffer from a bird-flu mutation—if we all left poultry off our plates.